First, congratulations to me for posting blog posts over five consecutive days. Enjoy it since this probably won't happen again for a long time. Today's video is from the band Cold War Kids. Shouldn't they be Cold War Grandkids since the Cold War has been over for at least 20 years? Anyway, I really like this song, titled First. Not sure I understand the video, but I don't understand lots of things. Facebook has this thing where they show you "Memories" of your stories from the same date of different years. Recently, Facebook showed me a post from 2009 where I shared 25 Random Things About Myself. I also shared this information (shockingly) in a blog post. Again, this blog is really old. Anyway, I thought it would be fun to revisit the 25 random things. 1. The first concert I ever attended was Neil Diamond. The most recent concert I saw was also Neil Diamond. The last concert I attended was Billy Joel. I also saw Billy Joel several times in high school. Perhaps I'll see a performer that's not an AARP member this summer! 2. I spend a good five minutes each morning trying to find a pair of matching socks. It now only takes me about two minutes each morning to find a matching pair of socks. Major improvement! 3. I enjoy being a soccer referee and know that I am a good ref; however, I don’t attempt to get to the next level because I don’t want to deal with even worse parents and players. I have worked higher level soccer games the past few years, and yes, the coaches and parents are definitely worse. I don't know what it is, but there is just so much complaining and arguing over any little call. It really has gotten worse. 4. I am addicted to fantasy leagues. Over the past year, I have participated in football leagues, 3 baseball leagues, 2 hockey leagues, a Rock of Love 3 league and several NCAA Tournament brackets. I joined a NASCAR league a few years ago, even though I know nothing about the "sport." Should I also mention that I’ll probably run an Oscar poll for this year’s Academy Awards? I've cut back significantly. Now, I'm down to 4 fantasy football leagues and 2 baseball leagues. If there's a new season of Rock of Love, though, I'm all in! 5. By waiting in line for over five hours, I earned free burritos for a year from California Tortilla. Over the next 52 weeks, I saved $278.09 in burritos and quesadillas. Ah, the good old days! Of course, I also earned free paninis for a year and burritos for a year again in 2014-2015. Between the two, I probably ate about $750 worth of free food. 6. Before meeting my wife, my longest relationship was 6 months. 7. The idea of buying and selling a home (the process is going to start soon) really, really scares me. We sold our condo and bought a townhouse about 6 years ago. Yes, it was scary. 8. Due to a stupid car accident that occurred just before the end of my junior year, I was voted Worst Driver in high school. I also finished second in the class clown voting. There is no truth to the rumor that there was a recount based on inaccurate balloting. 9. I cannot ride a bike; I am not going to elaborate on this. I still can't ride a bike, and my older son will probably start learning to ride this spring. I'll teach him how to drive in 11 years, but I'm not going to be of any use teaching him how to ride a bike. 10. My blog is an extremely important part of my life. Although it may not look like it, I spend many hours each week writing posts. With kids, I just don't have the time to write like I did 7 years ago. That's why you only see a few posts a week these days. 11. Many people work retail jobs in high school or college. 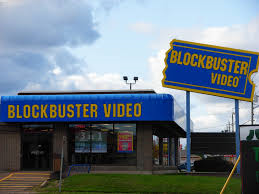 I worked at Blockbuster and Kohl’s after earning my Masters degree. I wore my Blockbuster shirt this past Halloween. 12. Assuming that the bus and Metro run on time and aren’t too crowded (huge assumptions here), I enjoy my 50+ minute commute each way as I have read more books for pleasure since I started my job 4 years ago than the rest of my life combined. The bus has been fine, but Metro is hit or miss these days. Plus, I haven't read any books this month though I'm up on my Washington Post Magazine. 13. I was a Politics major in college and even interned with my Congressman. Although I still follow politics, especially during elections, I hate all of the partisanism (is that even a word?). Things have certainly changed, haven't they? Everyone gets along now and both political parties work together effectively in the best interest of the American people. 14. I love my kitten and let him get away with just about everything. I hope that I’m not the same way when I have kids (the letting them get away with everything part). I'm probably a little lenient with the kids, but as long as they aren't hurting themselves, hurting each other or damaging property, I'm generally fine with what they do. 15. Speaking of kids I don’t have, I’m convinced that my children will not be Pittsburgh Pirates fans. I can’t see them supporting such a horrible team especially when they will likely attend dozens of Nationals games. 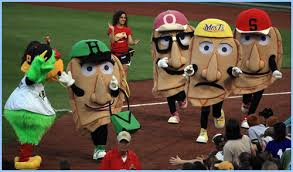 They are going to think that racing presidents are better than racing pierogies! The Pirates have actually been good. My kids really might be Pirates fans! 16. When I lived in Columbus, I was a below-average beer-man for the Blue Jackets, Crew and Clippers. 17. My driver’s license states that I am 5’ 7” and as a legal form of identification, it must be true. Sadly, a late-30s growth spurt didn't happen. 18. I used to be involved in dozens of activities, clubs and sports in high school and college. I don’t do much of anything anymore. Well, at least now I have the being a parent excuse. That eats up any free time. My Debbie Gibson knowledge remains strong and finally paid off. I had a top 10% finish in a Learned League Debbie Gibson quiz. 20. I want to write a book someday. Did you see where I don't have time to blog? How I'm not involved in activities anymore? Sure, I have plenty of time to write a book. 21. I love traveling and always need to have a trip to look forward to. Now this is sad. Besides going to Florida to visit the kids' grandparents and traveling for work once a year, I don't go anywhere. I want to go on a real vacation! 22. I performed in two award-winning musicals in high school. I made the cast through an awesome dance audition coupled with the fact that they needed more guys. Nothing new to add here. I'll just reiterate that I was amazing in my dance audition. 23. When I took the Myers-Briggs test about 10 years ago, I was an extrovert. The older I get, the more introverted I become. I really think I would land on introvert if I took the Myers-Briggs test today. Meeting new people is hard for me these days, and I find that I need my own time at the end of the day to recharge. 24. Here are random thoughts I have: how many total miles have I driven; what song have I heard more than any other; what toilets have I used the most in my life (#1 and #2 are in my parents’ house; #3 is my current home; there are several possibilities for #4). Recently, there was a major renovation of the office bathroom with brand new urinals and toilets. So do the new toilets restart the count or is the bathroom, and not the actual toilet, the key factor in the count? Um, so I guess I still have random thoughts. 25. I was a three-sport star in high school in soccer, tennis and swimming/diving. OK, star is a bit of a stretch. As you can probably tell, I also like self-deprecating humor. Still got that wonderful sense of humor! Well, that was fun. Maybe I'll revisit this again in 2023. A few years ago, the winner of one of my fantasy football leagues asked that we donate to Duquesne University in Pittsburgh rather than to send him money. This was even tax-deductible! This donation also put me on Duquesne's mailing list, so I now receive the Duquesne University Magazine. I recently received the Winter 2016 edition which features a story about Ken Gormley, the School of Law Dean who will become the 13th President of Duquesne University in July. I don't know anything about Gormley or his qualifications , and while we don't know much about anything here at Sean's Ramblings, we certainly know good mustaches. And Gormley has a solid 'stache. While the magazine includes a section showing quotes from various figures such as U.S. Congressman Mike Doyle, U.S. Senator Mark Warner, Frank Coonelly, President of the Pittsburgh Pirates, and Pittsburgh Mayor Bill Peduto, praising Gormley, none of these folks referenced Gormley's mustache or how his mustache is part of his leadership skills and abilities. 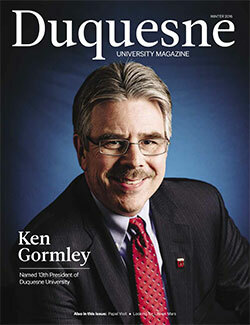 I hope the Duquesne University Magazine has a separate feature once Gormley becomes President about his mustache. I've mentioned several times that I'm part of the Learned League trivia league. I'm clearly one of the worst players in the league, but I enjoy it. That's not what this post is about though. There was a recent One-Day quiz about Route 66. I borrowed several questions from this quiz for today's Trivia Tuesday. I expect Eric, a Route 66 enthusiast, to do well. 1. Which American author coined the term “The Mother Road” for Route 66, in his depiction of the Dust Bowl of the 1930s? 2. Beginning in Chicago, Illinois and ending in Santa Monica, California, Route 66’s 2,000+ miles go through how many states, inclusive of the two termini? 3. Sheryl Crow could “drive up to _________ for the night, find some crossroad trucker to demonstrate his might.” Glenn Frey was “standing on a corner in __________, Arizona, such a fine sight to see.” While neither song is about Route 66, they each contain the name of a town along it. Complete the lyrics by naming both Route 66 towns. 4. What movie, whose setting was inspired by the small towns that were bypassed when Route 66 was replaced by interstates, was the highest grossing film of Paul Newman’s career? It was also his last feature film credit as an actor. 5. When President Dwight Eisenhower signed the Interstate Highway Act in 1956, it was the beginning of the end for the “Main Street of America.” As the new system was built, no single interstate was designated to replace Route 66; instead, 5 different interstates now make up the route that most closely parallels it. Name any 3 of those 5 interstates. 6. “Get Your Kicks on Route 66” has been recorded by Bing Crosby, Chuck Berry, the Rolling Stones, Asleep at the Wheel, and Depeche Mode, among others. However, it was first recorded in 1946 by what crooner and jazz musician? 7. 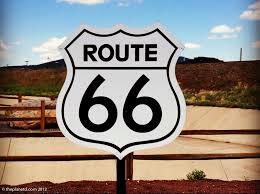 Route 66 was established in 1926 as one of the original highways in the U.S. Highway system. It was decertified and officially ceased to exist in what year? Other significant events to occur that year include Mikhail Gorbachev becoming leader of the Soviet Union, a Stanley Cup win for the Edmonton Oilers, and the release of New Coke. 8. In the summer of 1997, my Dad and I were stuck in this Arizona town on route 66 due to car problems. The part that we needed wasn't in this town and could not be delivered for several days due to a UPS strike. We ended up renting a car and visiting the Grand Canyon and Las Vegas. We also ate at the same diner in this Arizona town, also home of Northern Arizona University, at least three times. 9. Although he may not have ever driven on any portion of Route 66, this #66, one of the greatest hockey players of all time, won his second Stanley Cup against Chicago. As always leave your answers in the comments section below. In addition, don't use the internet for assistance. Good luck! A few months ago, I shared that I occasionally ate pizza bagels with ketchup instead of tomato sauce as a kid. This news nearly broke the internet with the outrage I received. So now I'm back with a new proclamation on how I eat incorrectly. When I was in school, if you didn't get lunch from the cafeteria, you brought your meal from home and kept it in your locker. My two staples were either Hebrew National salami or cheese sandwiches. These sandwiches would sit in my room-temperature (if not warmer) locker for several hours before I ate them. I guess maybe some kids had ice packs or lunch bags that kept their meals cool, but I wasn't one of them. Now that I'm an adult (by age though maybe not maturity level), I still regularly bring salami or cheese sandwiches from home for lunch. All these years later, I find that these sandwiches taste a little better if I don't refrigerate them. Essentially, my sandwiches sit in a Ziploc bag in my backpack for approximately five hours between the time I make them and eat them. If this is supposed to make you sick, apparently, I've built up an immunity over the years. 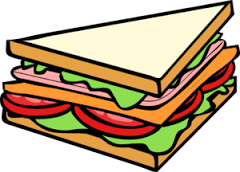 So am I alone on this one (again) or does anyone else eat sandwiches this way? Why do people not trust the Clintons? Why do people think Hillary Clinton is evil? Hmmm...not sure how that last one got in here. 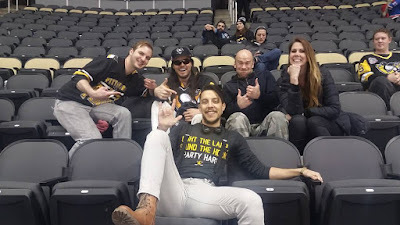 During the Penguins-Rangers playoff series last April, my friend Nicholas, better known as PSAMP (and also known as Tecmo from back in the day) started a campaign to make Andrew W.K. 's Party Hard the Penguins' goal song. After months of tweets and correspondence by hundreds, if not thousands, of Pens fans with the organization, the team obliged. I suggest you check out The Point of Pittsburgh and The Hockey Writers for more on how this campaign succeeded. Anyway, to celebrate the goal song, the Penguins invited Andrew W.K. and Nicholas to attend Wednesday night's game against the New York Rangers. It was going to be awesome seeing them and the arena celebrate when the Penguins scored. The Pens came in as one of the hottest teams in the league with Sidney Crosby scoring approximately 30 goals (plus or minus 20) the past 7 games. Despite getting more shots and more chances than the Rangers, the Penguins were held scoreless by arguably the best goalie on the planet, Henrik Lundqvist. Therefore, the goal song wasn't played. As I wrote in the post title, Stupid Henrik had to go and ruin this celebration. Nevertheless, it looked like Nicholas (center) and Andrew W.K. (wearing sunglasses) had a fun time. * Full disclosure: I never heard any of Andrew W.K. 's songs before this campaign started. I think I knew of him from being on MTV and VH1 shows. Update: The Pittsburgh Post-Gazette has an article about this too. You may have heard that there is an election in New Hampshire today. Even if for some reason you don't ever follow the news, I'm sure that you've seen this outstanding video from Saturday's Republican debate which I may have watched a dozen times. I've always wondered what it's like to live in New Hampshire during the nation's first Presidential primary. Does every candidate personally call you or knock on your door? My friend Ellen, also the author of the terrific Bookspired blog, moved to New Hampshire a few years ago, so I asked her about life in the Granite State. My perception is that New Hampshire, in terms of population, is rather small. With so many candidates spending so much time in New Hampshire over the past year, I feel like the odds of seeing or meeting a candidate are pretty high. So since you're a parent of young kids, what candidate has kissed or tried to kiss them? You know, I thought we'd run into a candidate or two in recent weeks or months, but so far we haven't. They're around, of course ... Many of the major events happen at St. Anselm College, which is right in our town. Carly Fiorina did a town hall meeting at our kids' future school this Saturday. I'm glad no candidates have tried to kiss my babies! Being serious (momentarily), what's it like being in New Hampshire days before an election where the whole country is watching (or at least will watch after the Super Bowl)? 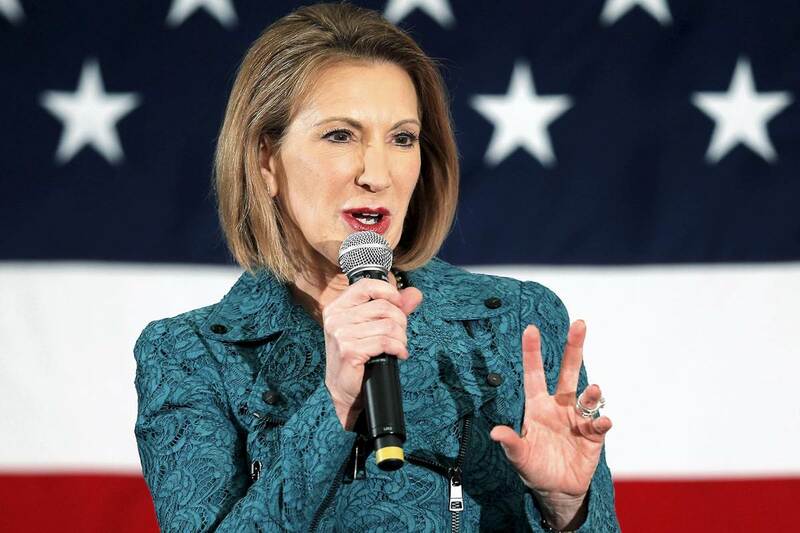 It is kind of exciting that all eyes will be on New Hampshire. We've had a lot of knocks at our door from canvassers. I'd say tomorrow we'll get more. The weirdest one happened yesterday. My attending nurse for my second daughter's birth knocked on my door to ask for my vote for Hillary. Really tugging at heartstrings. Just going to the grocery store or running errands, can you avoid the election or do people simply go about their business? People seem to go about their business. I thought I might have an exciting sighting at Market Basket, but nothing yet. So far, no one has approached me while I've been in public. They just come right to my house. The political signs are everywhere, though, similar to the situation in Northern Virginia. I decided to look up famous people from New Hampshire. 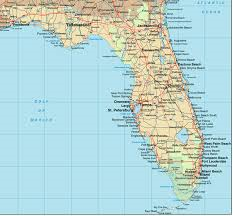 I figure (my perception again) that they are all traveling the state with the candidates they support. So who did Mandy Moore, born in Nashua (though she moved to Florida at two months) endorse? What about current Pittsburgh Penguin Ben Lovejoy? Basically, have you had any celebrity sightings either from people endorsing the candidates or even media members? I didn't even think of the possibility of meeting real celebrities! That would be truly exciting. 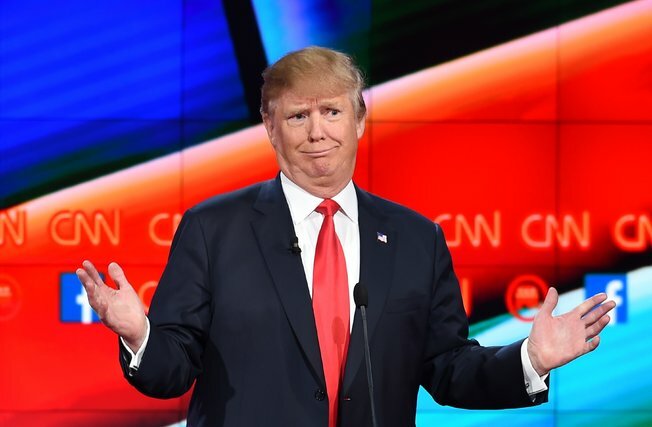 Mostly I've been thinking up choice words for Donald Trump, if he should cross my path. What do you expect when you go to the polls on Tuesday? Big crowds? Offers for a free California Tortilla taco if you wear your "I Voted" sticker? Hmm well they are pretty organized here in my town, and it's not that big, so I expect an efficient voting experience. I would love the bribe of free tacos, but it'd have to be Chipotle ... No California Tortilla in these parts! What do you expect New Hampshire to look like on Thursday? I expect there will be no candidates left in the Granite state ... they'll be heading to Nevada and South Carolina, I guess? Or maybe making their rounds in the other states in preparation for Super Tuesday? It'll be interesting to see how long the signs hang around. Jeb seems to have the most signs in our area ... maybe because of the proximity to the family residence in Kennebunkport. I think NH will be back to business as usual pretty quickly. Thanks again to Ellen for answering my questions. Tuesday should be fun in New Hampshire. Please make sure to check out Ellen's blog, Bookspired. During last year's football season, we established that Peyton Manning dresses terribly. He is probably the only person to tuck a football jersey into his jeans. Now, Manning is at it again. Hanging out at the gym with J.J. Watt and Papa John, Manning tucks his T-shirt into his gym shorts. Again, is Manning the only person to tuck in his shirt at the gym? I can't tell what he's doing with his football jersey at the end of the video either. It may not be tucked in, but it doesn't look right. Anyway, if you're not sure who to support in Sunday's big game, I doubt you'll see any member of the Carolina Panthers tucking their football jerseys into jeans or T-shirt into shorts at the gym. Wegmans celebrated its 100th birthday this weekend by giving away lots of samples, grocery bags and birthday cake. (My 1.5 year old - Pedro Tulo - loved the sheet cake.) While I really enjoy shopping at Wegmans and definitely appreciated the free swag, I feel partially responsible for keeping the grocery store in business. Wegmans opened in Virginia in 2004, so I have shopped at either the Dulles or Fairfax locations for 11-12 years now. I also shopped at Wegmans when I was in college for 4 years in Ithaca. Conservatively, I've probably easily spent $50,000 at Wegmans. You're welcome, Wegmans! The Moose: What do you want to be when you grow up? The Moose: (Excitedly) A Tiger! Although The Moose doesn't read yet, he is now a subscriber to Entertainment Weekly. He had some airline miles that were about to expire, so "he" redeemed them for a year subscription. I'm sure he's going to be excited to read articles about The Walking Dead. The Steel Trap published its latest, always entertaining First World Problems post.